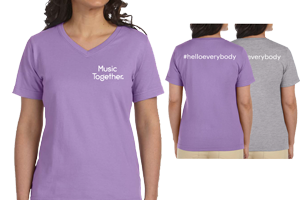 The Hanes ladies V-neck T-shirt features the Music Together logo on the front and “#helloeverybody” on the back. All T-shirt sales final. 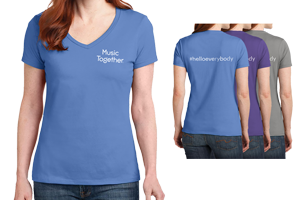 The LAT Apparel ladies’ 100% cotton premium jersey V-neck short sleeve T-shirt features the Music Together logo on the front and “#helloeverybody” on the back. All T-shirt sales final. 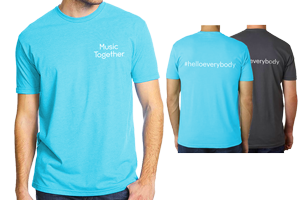 The Next Level Unisex super soft, crew-neck t-shirt has the Music Together logo on the front and “#helloeverybody” on the back. All T-shirt sales final. 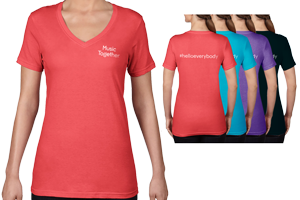 The LAT ladies’ V-neck, 3/4 sleeve, premium jersey T-shirt features the Music Together logo on the front and “#helloeverybody” on the back. 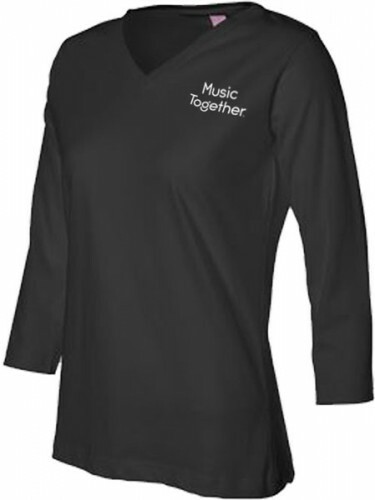 See other T-shirts for placement. All T-shirt sales final.